WASHINGTON (CNS) — A week into National Child Abuse Protection Month, Baltimore Archbishop William E. Lori visited the U.S. Conference of Catholic Bishops chapel April 8 to celebrate midday Mass for conference employees and reflect on the church’s work to develop policies and procedures to prevent child abuse by those within the church. “There are many motivations for wanting to get this right,” he said at the Mass. Such revelations call into question the church’s essential mission of evangelization, the archbishop said. He reflected on the day’s reading from the Book of Daniel in which Susanna is falsely accused of adultery, a sin punishable by death, by two elders who were thought to be pillars of the community but had made “traumatic sexual advances” against Susanna. “They laid blame on others, ultimately the victim herself,” the archbishop said. He said Susanna stands as “an image of victim-survivors who have felt trapped both by the sexual abuse they suffered and by the unavailability of justice that compounded their suffering. Her story highlights what goes wrong when perpetrators and self-interested parties — without any apparent oversight — act as the sole purveyors of justice. Reflecting on the psalm as well as the Gospel reading from John in which Jesus tells the people, “I am the light of the world. Whoever follows me will not walk in darkness, but will have the light of life,” the archbishop said followers of Jesus will not walk in the darkness of sin. In the context of addressing sexual abuse, this means abandoning the culture of secrecy and clerical privilege. “Let us therefore not allow the words ‘transparency’ and ‘accountability’ to become mere slogans, mere shorthand for policies and procedures — good, important, and necessary as these truly are. ‘Transparency’ and ‘accountability’ ought to mean that all we say and do in the name of Christ and the church must be done in the light, under the gaze of ‘the Father of lights in whom there is no shadow,'” he said. Afterward, Massgoers were encouraged to stop in the corridor of the USCCB building to “plant” a blue pinwheel in a pot as a symbol of the innocence of children. The Prevent Child Abuse America organization instituted the “Pinwheels for Prevention” campaign in 2008. While he was at the USCCB, Archbishop Lori also participated in a podcast for the bishops’ Secretariat for Child and Youth Protection with Deacon Bernie Nojadera, secretariat director. 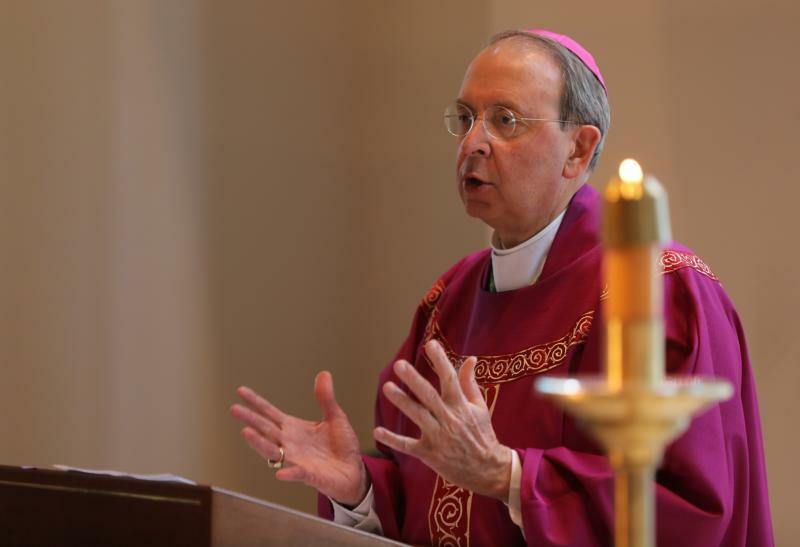 The archbishop, who was ordained a priest in 1977 and became an auxiliary bishop for the Archdiocese of Washington in 1995, said the bishops’ conference tried to deal with the abuse in the late 1980s, followed by proposed policies in the early 1990s, although those policies were not mandatory. “That was a decision that was not sound,” he told Deacon Nojadera of not including bishops specifically in the charter.